How to Have A Successful Yard SALE – Part ONE | Cook, Party, Enjoy! We’ve been doing a lot of cleaning around our house because it was becoming too cluttered. Every time we straightened up it would be just a day before or even just hours before the house was messy again. I consider that as a giant red flag that you have acquired too much stuff and not gotten rid of enough. My kids and I decided we would go through the house one room at a time analyze what we had and decide what to keep, what to replace and what to get rid of. . Now how do you get rid of all that unwanted stuff you’ve accumulated and maybe make some money back. The kids decided they would like to have a yard sale to make money for our beach trip in September. That seemed like a good idea and we also decided that anything left after the sale would go straight to The Salvation Army or Good Will. It was a great idea and I have pulled out all my past yard sale information I have gathered over the years to make our sale a success. NEED HELP WITH YOUR DE-CLUTTERING -College Hunks Hauling a JUNK is a great company to help you with your De-Cluttering. They hire college students and will come help you as labor only, or do the whole thing including hauling away any big stuff you don’t want to sell or keep. They even will clean clutter from your yard and/or demolish a deck or storage shed for you. Check them out on www.collegehunkshaulingjunk.com. We’re starting now in the last week of July for our Sale first week in September. You need three to four weeks to get everything together before the sale. A friend of mine who has since moved away was an amazing yard sale giver. She had been in retail and her yard sales were always a hit. She would sometimes make not hundreds of dollars but well over a thousand selling stuff her family had used and enjoyed. I am going to share many of the tips she shared with me plus many others I have picked up over the years. The difference between a successful yard sale and a sale where no one comes and you spend your time waiting for nothing is planning. It takes work to prepare for a yard sale. Dragging a bunch of junk out into your driveway or in your garage, throwing up some handwritten signs and expecting people to come and spend money is a fools task. You are wasting your time and your Saturday. Planning is the difference between having customers, making sales and watching the money roll in or spinning around in the hot sun trying to take care of customers who do show up and want to know prices, try an electric appliance, asking endless questions and buying nothing or waiting for customers that never come. The first thing I am going to do is get my stuff together. Just like on those TV shows where they help people declutter their homes we are going to do one room at a time armed with a box for keeping, a box for the yard sale/goodwill, and a giant trash bag. I am figuring this will take us a week to go through the house. A great tip that Cherri shared with me was during the de-cluttering process we should keep price tags close at hand and price the items as we put them in the collection box. This is of two fold benefits. It finalizes our decision to sell the item and it eliminates having to go through the stuff again to price it. She advises the price should be one fourth of the items price new unless it is still in new condition in the original box or with tags. Here are some tips on deciding what to sell and what to keep. Clothes do sell at Yard sales if they are priced reasonably. Prices for clothes range from two to five dollars average and ten dollars being on the high side for brand name designer items. Think thrift store prices. I am going to go through them and try to make the hard decision. How nice it would be to have that space back. If you haven’t worn it for two consecutive seasons you could probably let it go and let someone else actually wear it. Now if the clothing is vintage or really special then hold on to it I do believe in keeping classics, if it fits and it might come back in style then hold on to it if you have the space. My sister gave me six Polly Flinder’s Dresses that had belonged to my niece with all that adorable smocking, when my daughter was born size ten and I kept them until my daughter could wear them and I was very glad I did they were adorable. Make sure all the clothing you plan to sell is clean and in good repair if it is damaged then best to tear it up for rags. Clothing sells best at a yard sale when displayed hanging or neatly folded. You can run clothes line between trees for hanging or use clothing racks if you have them. If you hang your clothes and want to keep the hangers be sure to put a big sign that says hangers not included. You can choose to include the hangers at an additional charge of say 10¢ if you want to. But be clear or people will assume they get to keep the hangers and that will cost you unless they are those wire hangers from the dry cleaners and you want to get rid of them. DO NOT SELL FINE JEWELRY OR EVEN EXPENSIVE COSTUME JEWELRY AT A YARD SALE!!! Now for regular costume jewelry you could expect to get one to ten dollars for pieces. I price them again using the thrift store pricing. I also keep the Jewelry close to where I am sitting so that I can keep an eye on it. Ziploc bags are perfect for displaying pieces and keeping them clean and sets together. If I have more expensive pieces I will take them to a jewelry store to sell, consignment shop, or ebay. I do not think Craigslist or the like is a good way to sell expensive jewelry, too risky having people come to your home to see your expensive jewelry. I did make an arrangement with a local Jewelry Store where I advertised my diamond on Craigslist but met potential buyers at the Jewelry Store, it worked out really well and if the buyer wanted a jeweler’s opinion there was one available. It was a WIN-WIN. My friend Cherri told me to always keep the boxes for toys and small appliances. She would keep hers in her attic. I never had the luxury of a place to store them but if you can it really helps them sell for a lot more at a yard sale or consignment shop. She would usually get half of what she paid and they sold like hot cakes. Especially games. Have the kids go through their own stuff. Tell them to fill their sale box and all the money from their toys will be theirs to keep to buy new toys. This is an excellent motivator for kids to part with toys they no longer play with. I use different colored price stickers so I know whose toys belonged to who and when the toy is sold I remove the sticker and stick it on a poster board with a column with their name so they can see at a glance how their toys are selling. One time My youngest Andrew ran back in the house and got a whole box of more toys to sell. Many of our kids have a collection of all those small toys that they get at McDonalds, Burger King, Chic Filet, etc… And if that’s the case I put some in a ziploc sandwich bag and price it accordingly. Like 10¢ or 25¢ depending on how many toys are in the bag. You can do this with any small items. Another good tip here is that each time a toy comes in to the house an old toy goes out. Once you have all your yard sale items pulled and ready to go it is time to consider the sale itself. Where will you hold the sale and what will you use to display your items. If customer is Concerned about recalled toys give them this website to check. If you have too many Books – go through them, weed out any you no longer want to keep. Reference books can be replaced by the internet and could be considered for discard. Maybe purchased at your sale by someone who doesn’t have internet. Records, CD’s, Cassettes – Soon there will not be a very limited market for these items. Now is still a good time to sell all those various formats of music you aren’t listening to anymore. (People have digitized their entire music libraries to homemade cd’s, and they sell their entire CD or record collections at these sales). Pricing for records is really hard because they are more for collectors so I would check ebay for pricing. CD’s are becoming obsolete so fifty cents to two dollars might be possible, again check ebay if it’s a famous artist. Unopened toiletries, colognes, lotions, unused cosmetics, accessories will often sell. Shower curtains, rings, bath mats, towels in good shape with no stains or tears sell. Blankets, bed spreads, comforters, sheets, table cloths, napkins, place mats, aprons all clean, free of stains or wear sell. A good rule of thumb for your home is to have two set of linens for each bed in your home (two top sheets, two bottom sheets, 4 pillowcases, 2 comforters (warm weather and cold weather) and blanket for each bed.) That way you have a set for when you wash the set that is on the bed. Only one to store. Any more than this could be considered excessive. What Sells Well out of the Kitchen: dishes, drinking glasses, cookie jars, utensil holders, pots, pans, those woks, serving dishes, and don’t forget all the gadgets, they all do well at a yard sale. Caution here… Higher priced items should not be sold at a yard sale but should be sold on consignment or on the internet. Typically, people coming to yard sales are looking for bargains, deeply discounted stuff. If you are selling a Longaberger basket don’t sell it at your yard sale. Same thing goes for your Kitchen Aid Mixer. I do a cabinet at the time. I empty it completely and place everything onto the kitchen table or counter. Then I wipe the cabinet out. After I have cleaned the cabinet I look at all the stuff that came out and make the hard decision. What goes and what stays. The stuff that stays I put back in the cabinet. The stuff that goes I price and put in my yard sale box. I then move on to the next cabinet until I am done. In my kitchen I have a shelf unit, a cabinet, a closet and a pantry. I do them just as I did the cabinet. TIP: As I accumulate stuff for the sale I will run it through the dishwasher so that it looks all shiny and bright making it much more inviting to buyers at my sale. Now believe me when I say that having tools at your yard sale or anything guys like will help you with your customers. Why you ask. Because many women come with their husbands or significant others and having something to keep the guys occupied gives the women more time to shop. Plus what guy can resist buying a tool? Don’t forget to look at your furniture. Be ruthless. If a piece is outdated or you just don’t use it anymore then consider getting rid of it. Prices for furniture consider ten to thirty dollars for a coffee table. Prices for sofas range from twenty five to one hundred dollars. Dining room tables can be twenty five to three hundred dollars. If you want more than that I suggest ebay, craigslist or other internet selling site. Or even a local community newspaper. Electrical Appliances, small and large. Anything battery operated. Make sure you have a plug close by so people can try stuff or batteries at Your Check Out Table for them to use to see if something works. It can get too expensive to let fresh batteries go with the stuff but it is up to you. WHAT ABOUT SOMETHING THAT IS BROKEN??? I read once that the very first item that sold on ebay before it was even named ebay was broken. It was laser pointer. So consider this even if you think it can’t be repaired there may be a guy or gal that knows just how to fix it. So if you have a broken radio, tv, computer, printer, bicycle, chair, small appliance, etc… then offer it for sale. Just make sure you let the potential buyers know that it is broken. Planning makes the difference between Making Money or Wasting your TIME! Once you have all your yard sale items pulled and ready to go it is time to consider the sale itself. Part Two – Time Line for the yard sale. 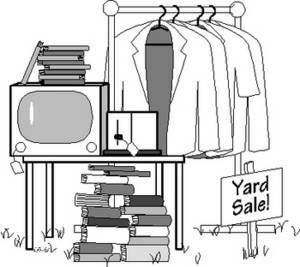 Part Three – How to advertise the yard sale. Part Four – Where will you hold the sale and what will you use to display your items.